In "Leopard Mode", its Special Moves are causing towering pillars of bedrock to appear from the ground, tossing the opponent (Wolkenkratzer), and running across the land and flying through the sky, tearing the opponent apart from every angle (Blockade). 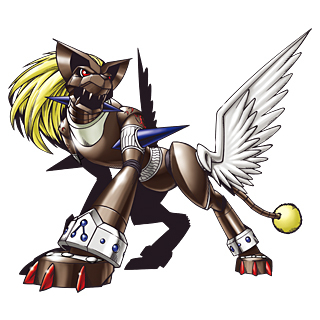 Also, the spherical tip of Duftmon's tail generates globe-shaped energy mines that become its weapon "Eroberung", which it strategically encircles the opponent with. 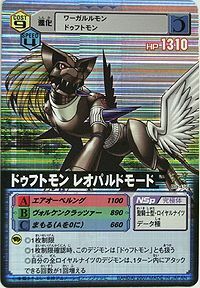 This profile matches its partner in the Digimon Reference Book, except that there are German translations for its Special Moves. n., From Black Leopard, also a reference to both the Leopard Panzer and the Panther. 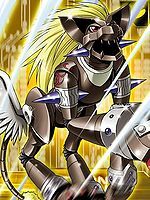 Anime/Manga Digimon Xros Wars: "Xros Warrior!! The Released Demon!!" 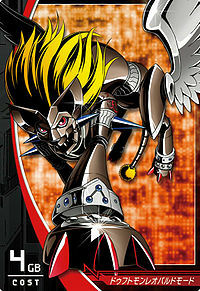 While Duftmon: Leopard Mode retains most of Duftmon's features such as its armor which is based on elements from the German Gothic harness, ditstinguished by its angular and spiky appearance, which was used by German knights in the 15th Century, its appearance is more focused on that of the black leopard. 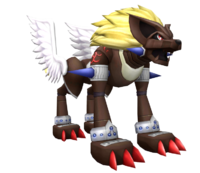 Its two prominent white wings are now present on its hindlimbs and the yellow tip of its tail is capable of generating spherical energy mines. Creates globe-shaped energy mines with its tail. Tears at the opponent from every angle. Wolkenkratzer  Deu: "Skyscraper" ヴォルケンクラッツァー Vorukenkurattsā Vulcan Crusher Tosses the opponent with pillars of bedrock that erupt from the ground. 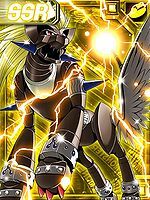 Duftmon's attack is "Leopard Mode". 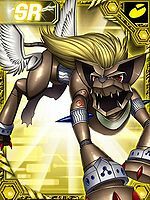 The form Duftmon takes on while on the battlefield. 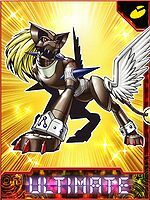 It sprints gallantly through the battlefield and soars through the air, in order to gather information on the state of the battle and use its Special Moves in the most strategic way. 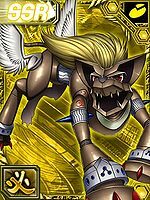 ↑ Duftmon's attack is named "Leopard Mode" in Digimon Story: Sunburst & Moonlight.